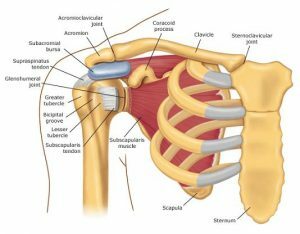 Have you ever wondered why you have shoulder popping? I often hear this question in my practice, “Why is my shoulder popping?” There are multiple reasons for this common issue. 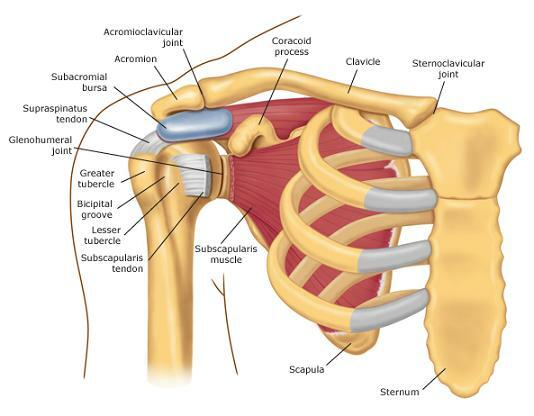 The shoulder is a complex and unstable joint. It is comprised of bone, ligaments, cartilage, and tendons that allow for the ease of movement in so many different directions, but this is also why the shoulder is a commonly injured joint that results in shoulder pain. Why do I have shoulder pain and popping? Is the popping you feel painful? Has there been a recent injury of your shoulder resulting in any pain? 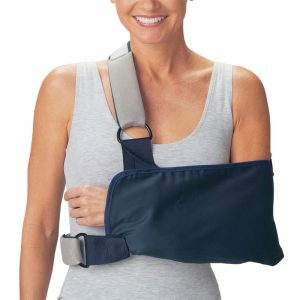 Does my shoulder feel stable? Is it accompanied by any weakness? Clicking and popping can occur for many reasons. If it is painless, it can be just a harmless joint noise known as crepitus. On the other hand, if it is associated with pain it may be due to the degenerative arthritis from years of wear and tear. This occurs when the cartilage that protects the bone has worn down and becomes rough. If the joint is no longer smooth and there is increased friction, it can develop injury through the joint rubbing together like two pieces of sand paper. The result is increased joint inflammation and shoulder pain. It can continue to progress causing loss of motion, strength, and eventually inability to use the arm. Clicking and popping can also be due to repetitive over use of the shoulder resulting in bursitis and tendinitis. These conditions occur from too much of the same activity that causes swelling in bursa sac and rotator cuff tendons. Bursae are fluid filled sacs that cushion each joint in your body, in this case, the shoulder. The tendons are the cords that connect the muscle to the bone. The rotator cuff tendons can become worn down slowly over time much like the sole of a shoe that eventually wears apart. If left untreated, the result is a tearing of the rotator cuff tendon causing increased pain, inability to sleep, lost motion, decreased strength, and inability to use the arm with many daily activities. Shoulder pain and impingement occur when the space between the top of the shoulder blade (called acromion) and the top of the upper arm bone (called head of the humerus) is narrowed due to swelling and inflammation. This causes a pinching of the rotator cuff tendons and bursa. Untreated, this too can lead to tearing of the rotator cuff tendons and lost function in the shoulder. Shoulder instability occurs when the head of the upper arm bone (humerus) is forced out of the socket. This can be either partially out of socket (called a subluxation) or completely out of socket (called a dislocation). In many cases, the ligaments (which hold the bones together) are too loose. This laxity can be genetic or traumatic in origin. The result is additional damage to the cartilage (labrum) of the shoulder and increased pain and weakness. If left untreated, the episodes can increase in severity and frequency. This can cause increased risk of arthritis. We discuss how to do the above on your own in our Online Course. In addition to the above treatments, Physio Physical Therapy utilizes the ML830 Cold Laser (Microlight). The 830Laser is designed to decrease pain, decrease inflammation and increase tissue healing. This treatment does not wear off like heat, ice, or medications. If you don’t re-injure the area, the pain should not return. The first step is to decide that you want to improve your situation. If you are motivated to improve, we can help you. We are experts in how to deal with shoulder pain and popping, this is a problem we deal with on a regular basis with a very high success rate. We are committed to helping you live a healthy and pain free life. We work closely with physicians and other health care providers to make sure you have the best care available. Be wary of other physical therapy clinics who use treatments such as heat, ice, and ultrasound as these treatments do not address the root cause of the shoulder pain and problem and wear off.